Escape is actually a poor choice of words, Grand Island treated Gillian, Elena, and I very well and we feel incredibly guilty for leaving. We made some wonderful friends, gained amazing job experience, had a great house, and welcomed our first child in that town but both our families are in Omaha and I was give an opportunity I couldn’t refuse. We were never going to be in Grand island forever, and I think everyone that knew us realized that but they way left did come as a bit of a shock to everyone, including us! We had discussed moving to Omaha (or Denver) off and on for nearly the entire time we lived in Grand Island but at the beginning of the year we had decided that we would just live in GI, we had never really felt settled and that bother both Gillian and I. We stopped making decisions with “what if we move to Omaha” in mind. We bought new furniture, we took a trip to North Carolina and flew out of Grand Island, we planed our trip to Germany, and I was planing on putting up a new fence when we got back. Hell, I was even considering moving to a bigger house in Grand Island. During the summer I was worrying about things like Elena’s first birthday and the international flight we would be taking with a one year old, a new job was the furthest thing from my mind. So naturally, two weeks before the Germany trip I got a call from an odd sounding company, conduct…something. The only reason I called back was that the message was from the HR manager of the company and not some random job recruiter…I am not a fan of recruiters. Things move quite quickly after that, I called them back on Monday, on Tuesday I had a phone interview and before I got off the phone set up a in-person interview for Friday…and Sunday we left for Germany. I was offered and excepted the job while still in Germany. This meant that after taking a two-week vacation we had to come back and quite our jobs and tell our friends we where leaving, I have never felt more like a jerk in my entire life. Less than a week after we got back from Germany our house was up on the market. A month later I was on my way to Omaha with my clothes, the cat, dog and not much else. The next morning I started my new job, and Gillian and Elena came down with more clothes and not much else. At this point we had moved into Gillian’s Aunt and Uncle’s basement, leaving our house and most of our stuff in Grand Island, hoping it would sell quickly…needless to say it was a little stressful. Moving into Renee and Howland’s basement was a huge help, actually huge isn’t a big enough word. Because of Renee and Howland generosity we were able to move to Omaha without a significant financial burden or the need to move in with my in-laws or my mother and for that I am eternally grateful!! 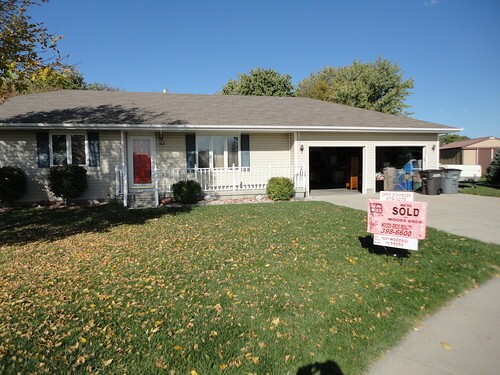 Lucky, a month after moving to Omaha, Sept 29, our house in Grand Island sold! I will say that it is a lot easier to keep a house clean for showings and open houses when you are not living in it. In total the house was on the market for 60 days, a number that still amazes me as I thought it would easily take twice that long. We had all of October to get everything out, closing date was Nov 8th, and I spent most Saturdays driving down with the CFO truck, another thing I am grateful for, filling it with all the things we had collected over our 6 years in Grand Island and move then into a storage unit…a very large storage unit. During this time we also found a house that was the right size, in the right neighborhood with the minimum number of required garage spaces, but that will have to be the topic of my next post as I have already rambled on far too long and I don’t have any pictures of it yet because Gillian says the house looks too messy. In the end we will miss Grand Island, it was good to us and we will be back to visit, but Omaha is home, it was always home. This entry was posted on December 15, 2011 at 8:03 pm and is filed under News, Rants. You can follow any responses to this entry through the RSS 2.0 feed. You can leave a response, or trackback from your own site.